Like an exotic grass, graceful papyrus is a unique accent that gives a landscape the look of a tropical oasis. It forms an attractive clump of stalks with a grassy top that's actually made up of flower bracts. The plant blooms during warm months with tiny, inconspicuous flowers. Like bougainvillea, the bracts are the showy, ornamental part of the plant. This is a great plant for a casual, eclectic landscape, but it won't work well for people who like everything "just so" in a more formal setting. Though it's sometimes used as a marginal pond plant, you don't have to have a water garden to grow it well - simply a sheltered spot with regular irrigation and soil amendments to help hold moisture will suffice. This an excellent choice for areas that stay moist after a rain since the plant doesn't mind "wet feet." 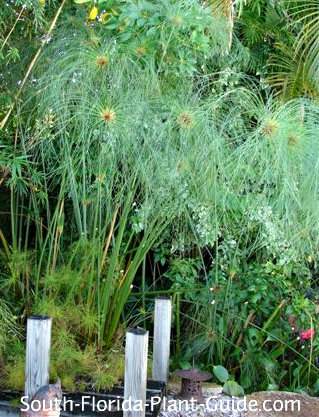 The most whimsical one of the bunch is the Egyptian or giant variety (Cyperus papyrus). It's pictured above. 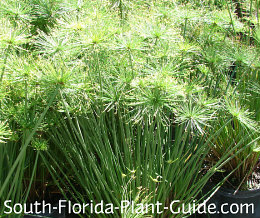 It's a very impressive plant with stalks as much as 10 feet tall topped with feathery fluffs of cascading greenery. These plants were known in ancient times as bulrushes and the stems were used to make paper. 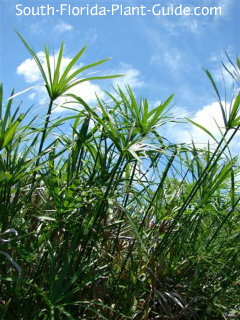 A somewhat shorter variety (pictured left) is often called "Umbrella Sedge" (Cyperus alternifolis). Its striking appearance is like a cross between a palm and a small bamboo. This plant can grow 6 to 8 feet tall and has a very dense growth habit. Dwarf cultivars (pictured below) grow about 2 to 3 feet tall and work as beautiful little accents. All are spreading plants so growing in a contained area is best. They can be invasive, so avoid planting near wetlands or preserves. Heights range from 2 to 10 feet depending on variety. Papyrus takes almost any kind of light - from full sun to partial shade - but seems to do best with a few hours of shade in the hottest period of the day, midday to mid-afternoon. Find a sheltered spot out of the wind - the tall stems can bend and break and detract from the plant's good looks. In addition, if the "head" hits the ground it will likely root there and grow a new plant. Best in Zone 10, these plants also grow in Zone 9B, but can be damaged by cold and look bad through winter. Generally even if stalks die back new shoots will appear in spring. Add top soil or organic peat humus to the hole when you plant. This will help the roots absorb more of the water they love. 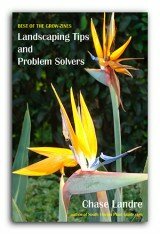 You'll likely have to cut out browned stems from time to time to keep the plant looking tidy. If the plant is growing too wide, divide it in spring (late March or early April). Water is the most important thing for these plants - they need a good soaking on a regular basis. You can add water retention crystals to the hole when planting with other things that don't like quite as much moisture (see the page on Watering for more info). 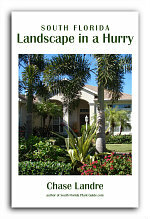 Fertilize 2 times a year - in spring and fall - with a good granular fertilizer. Give this plant enough room to spread out...plant 3 to 5 feet apart from each other. Come out from the house at least 3 feet. For placing by a walk or drive come in 4 feet or more for larger varieties. These bigger plants should be placed 4 feet or more from other plants, especially the umbrella papyrus which can grow into a very thick clump. The dwarf ones, though, can go as close as 3 feet from each other and everything else. This plant will grow in a container. Place a saucer beneath the pot to keep filled with water. 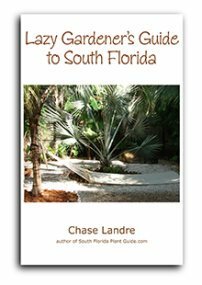 COMPANION PLANT SUGGESTIONS: Use with other plants that like regular watering, such as walking iris, dwarf ruella, heliconia, and star jasmine.